Bali is one of the most beautiful places in the world, combining natural beauty with the most friendly and happy people you will find. Making the long trip to Bali was one of the best decisions I ever made. The island is stunningly beautiful. The beaches and snorkeling are fabulous. The people are so happy, kind, and helpful, it’s truly refreshing. I will go back to Bali many times, and I suggest you do the same. There are many very inexpensive hotels in Bali, but if your travel budget will allow it, do not even think twice before choosing the Aman Resorts for your stay. 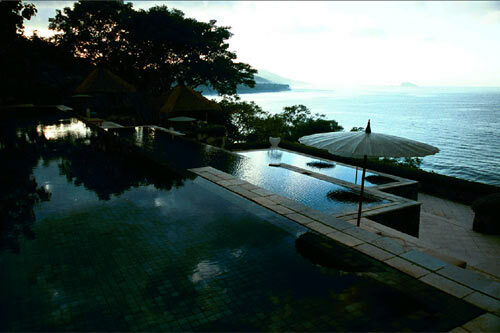 There are four Aman Resorts in Indonesia: Amankila, Amandari, Amanusa, and Amanwana. The Aman Resorts take pride in having the best service of any hotel in the world and their resorts routinely rank amongst the top hotels in the world. The ratio of staff to guests is shocking as it is not unusual to find twice as many employees at the hotel as they have guests. The staff will meet every night to discuss each guest’s itinerary and plan for being entertained while in Bali. They will make certain you take advantage of all the island has to offer. They will assist you with guided hikes, spa treatments, a massage on your private balcony, drivers to take you anywhere you want to go. 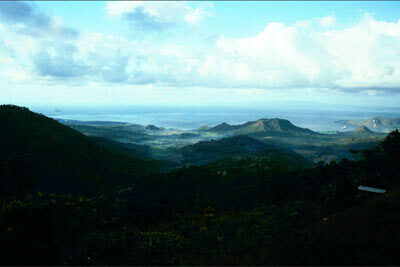 Amankila means peaceful hill and is literally built on the side of a mountain. Exercise buffs will love the stairs that can be used for working off the calories from your delicious Indonesian meals. My favorite story about Amankila illustrates the amazing service. While sitting in front of the “disappearing edge” pool looking out over the ocean having breakfast one morning, I noticed one of the Amankila employees picking up the leaves that had fallen on the ground. Nothing surprising there, except that he was literally picking up the leaves one by one with his hands. There weren’t enough to rake, but there were apparently enough to ruin the absolutely perfect appearance of the lawn. Our stay was fabulous, with a wonderful barbecue dinner on a private beach (meaning my wife and I were the only ones on the beach, other than our cook and waiter), tranquil massages on the balcony outside our room, and a wonderful hike up a mountain where the locals are building a new temple and had to carry rocks up the mountain on their heads. Amandari is located in the quaint town of Ubud. The cultural heart of Bali provides the perfect setting for this top-rated resort. Its location on a ridge overlooking a river is magnificent. The fact that it is in a small city allows you the opportunity to do some shopping in Bali’s diverse stores. Ubud has a fabulous selection of baskets, furniture, and artifacts. 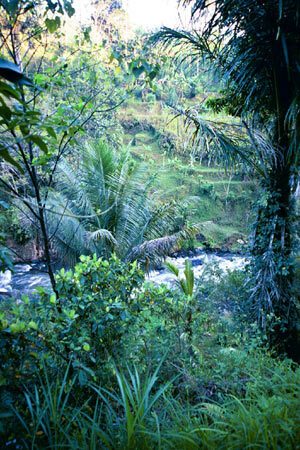 In the afternoon you should take a river rafting trip down the Ubud river. My favorite story from my stay at Amandari further shows the impeccable service you will find at Aman Resorts. We had gone in to town to shop, and got caught in a rain shower. We ducked into a bar and decided to wait it out. We told the bar manager we were guests at Amandari, and without prompting, he called the hotel. They were so upset that we were stranded in town, they sent a driver to bring us two umbrellas in case we wanted to walk around more. Amandari offers the fabulous river rafting trip, great shopping, fabulous guided hikes through the jungle, and wonderful views of the Ubud river. If you don’t want to spend the money to stay at Amandari, you should nevertheless make the trip and spend a night or two in Ubud. It’s wonderful! Amanwana is my favorite of all the Aman Resorts. Guests stay in tents with hard walls and soft roofs. This is not just any tent, however, as it is one of the most luxurious rooms I have stayed in. The best feature is the fact that ten feet from the front door of my tent was the water’s edge and ten feet beyond that was a beautiful coral reef that when the tide came in enabled wonderful snorkeling directly in front of my tent. The hikes at the Aman Resort are truly wonderful. The most impressive is actually more than a hike. The ‘waterfall excursion’ involves traveling by boat, jeep, and on foot, and is well worth the journey. Amanusa is the most urban of all the Aman Resorts found in the main tourist area of Nusa Dua. It is relatively secluded and sits on a golf course, but it is conveniently located near many tourist attractions. 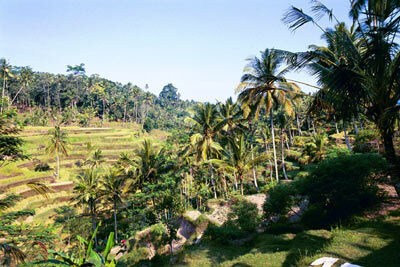 You can arrange a round of golf on their private course or choose to shop in a more touristy environment than Ubud. Make sure that if you ever have the opportunity to go to Bali that you take it, and that you stay at the Aman Resorts while you are there. Tom Schmidt is a travel writer for www.SearchingCities.com and is a tour writer for http://www.NewYorkPartyShuttle.com, the hottest new sightseeing tour provider in New York City. Tom also writes for www.tour-new-york-city.com.